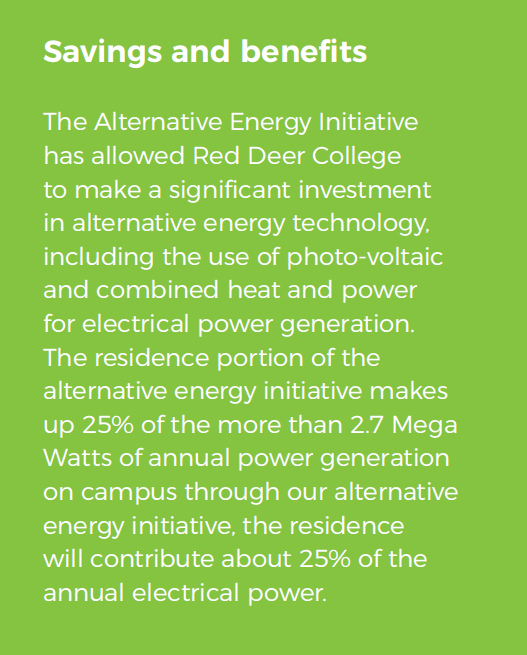 Red Deer College has a strong commitment to environmental stewardship through the use of sustainable and energy efficient technologies. As part of a larger alternative energy initiative, the construction of the new residence is a key demonstration of our commitment to incorporating alternative energy technologies to generate electricity, while reducing greenhouse gas emissions. In 2015, the College began work on an Energy Master plan that would outline how the College would move forward with various energy efficiency initiatives. It was at this time, that the College set a significant goal of a 20% reduction in energy costs and an equivalent reduction in greenhouse gas emissions. 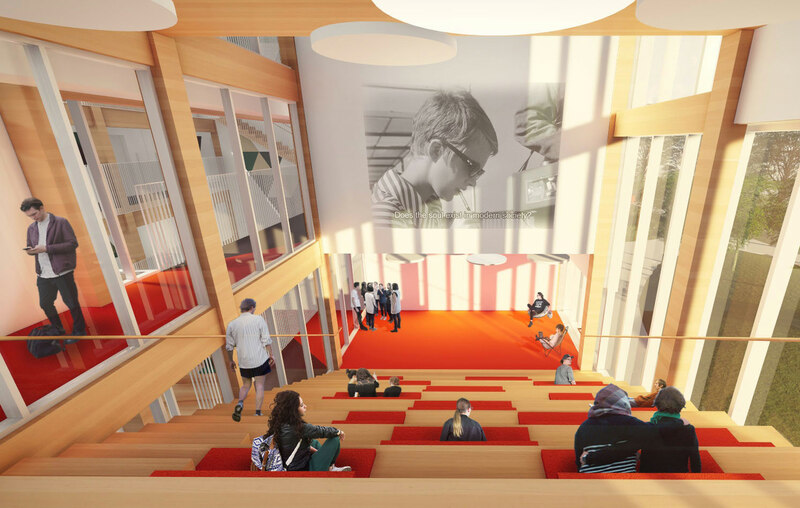 "Red Deer College’s new residence building will be innovative, beautiful and functional. 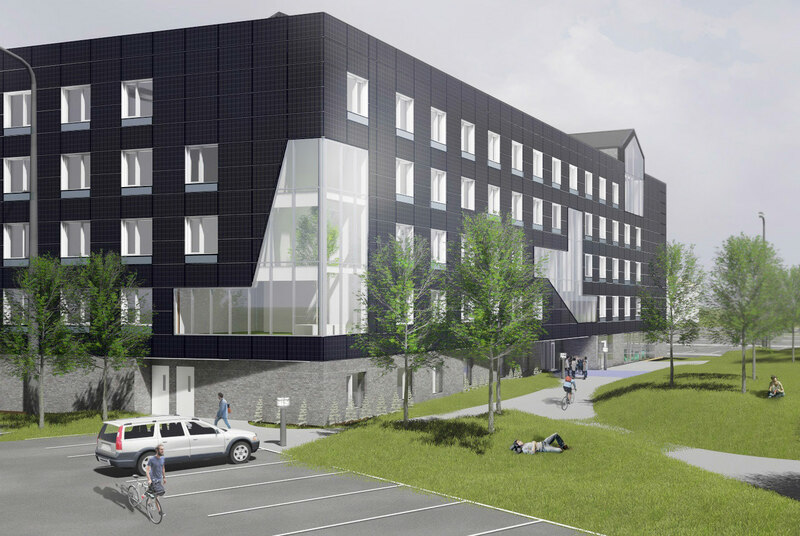 It will position our college as one of the leaders across Canada when it comes to integrating vertically installed photo-voltaic panels into the design and cladding of a residence facility." technologies to students, faculty, business and industry. Applied research initiatives will capture data related to power generation with the added benefit to students who will learn about various installation methods and their effectiveness. In addition, we can assist business and industry in the adoption of energy efficient technologies. Q.ANTUM solar module that provide a high yield per surface area. In addition, they provide optimal yields, whatever the weather, with excellent low-light and temperature behaviour. It is anticipated the panels will generate 156,600 watts of power annually to offset the operating costs of the building. To maximize the use of this power, the building has a high performance envelope including R45 insulation, triple glazed windows and LED lighting throughout. the photo-voltaic panels on the side of the building. This was the first new construction project in the city that incorporated alternative energy into the design of a building. In addition, we worked with the city for permits allowing us to put energy back into the grid when the college generated excess capacity. 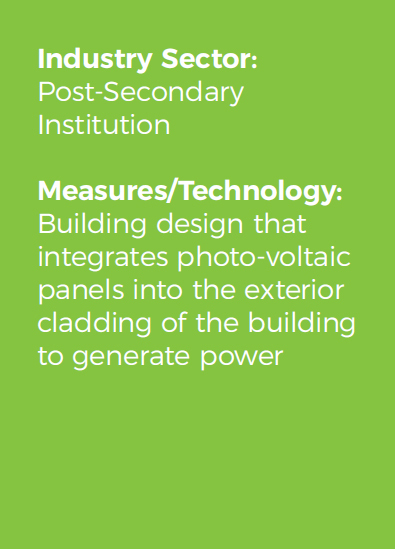 The residence is part of the College’s alternative energy initiative to generate power through assorted technologies including photo-voltaic panels. In a college setting, we have the opportunity to profile and demonstrate the latest alternative energy.